Robert Nesta “Bob” Marley came into existence on February 6, 1945. Marley, like Marcus Mosiah Garvey, hailed from Jamaica. While he traveled the small planet called Earth most of his life was spent on that Caribbean island. I can remember General Gordon Baker Jr. leading demonstrations in Detroit in the late 1960s early 1970s chanting, “UAW means – You Ain’t White”. The UAW he was referring to was the United Auto Workers. The UAW was founded in May 1935 in Detroit, Michigan. Baker (September 6, 1941–May 18, 2014) was an African labor organizer and activist. According to the Editor of the Pan African New Wire, Abayomi Azikiwe: “In 1965, Baker wrote an open letter to the draft board, refusing its request that he appear for an examination to determine his fitness to serve in the Vietnam War, a landmark in American draft resistance during that era.” Baker became one of the first people in the United States to resist the draft. At the same moment in history, reggae icon Bob Marley was a member of the United Auto Workers Local 1183 in Wilmington, Delaware. Marley too got his greetings from Uncle Sam. Instead of going to Viet Nam he chose to return home to Jamaica. Christopher John Farley who wrote the volume, “Before The Legend: The Rise of Bob Marley” discusses Marley’s time at the point of production as an automobile factory worker. The mid-sixties and early seventy were trying times for Bob and Rita Marley who were married on February 10, 1966 in a ceremony that took place in the office of the justice of the peace in Kingston, Jamaica. Years later when Peter Tosh aka Wolde Semayat and Neville O’Riley Livingston aka Bunny Wailer split off from Bob’s wing of the Wailers. 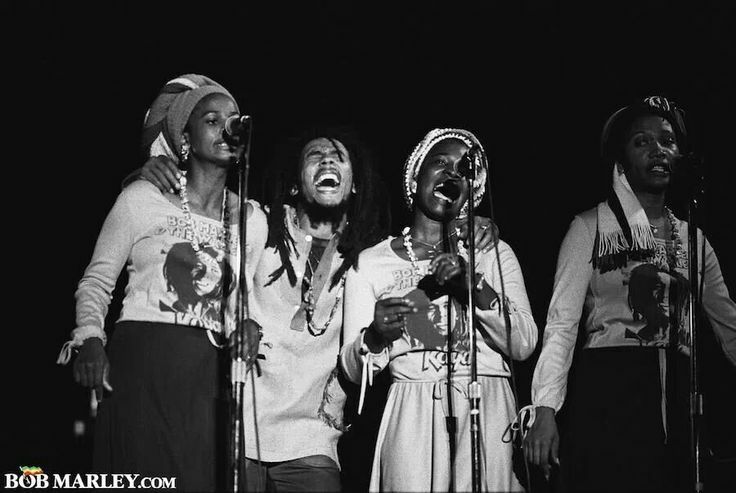 Bob would bring in Rita along with Marcia Griffiths and Judy Mowatt, who gained recognition as the I Threes backing vocalists for Bob Marley and the Wailers. I was blessed to have interviewed Rita, Marcia and Judy. One of the things that struck me was that all three listed New Orleans, Louisiana born Mahalia Jackson as a major influence. It was not only the fact that Jackson was a great vocalist. They all told me separately they admired the fact that she was Dr. Martin Luther King Jr.'s musical lieutenant. They said she stood for truth and rights and social justice which impressed them all. Black” in 1971. Between 1974 and 1981 she was a member of the I Threes. She continued to record as a solo artist throughout the 1970s, working with producers such as Sonia Pottinger, an unsung successful woman record executive. Pottinger (June 21, 1931 – November 3, 2010) is one of the most important Jamaican women involved in music business. Griffith’s biggest selling recording was her remixed rendition of Bunny Wailer’s song “Electric Boogie” and it was this version that made the Electric Slide, a line dance, an international dance craze. “Electric Boogie” remains the highest-selling single by a female reggae singer of all time. Jamaica’s greatest female reggae artists. She released “Black Woman” album in 1980 it is considered by many critics to be the greatest reggae album by a female artist. “Black Woman” was the first reggae album produced by a woman. Her album “Working Wonders” became the first album nominated for a Grammy Award in the category of reggae music in 1985.
recording industry. The white-male corporate executives have been comfortable with women sitting behind a piano and crooning. Woman such as Sonia Pottinger, Rita Marley, Marcia Griffiths and Judy Mowatt have proved that as the classic song says, “It Ain't Necessarily So.” They have proven themselves and stood toe-to-toe with the brothers in the industry.